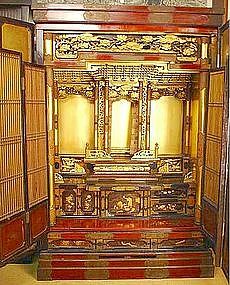 An especially fine Meiji Period (1868 - 1912) Gilded and Red and Black Lacquered Butsudan (Japanese Buddhist Altar) with an endless variety of luxuriously designed details, hidden drawers within secret compartments behind hidden panels, marvelously rendered images and elaborately carved sculpture. All other butsudan pale in comparison with this rare, museum quality showcase piece. This piece would have taken the maker close to 2 years to complete. 65 x 44 x 27 inches (166 x 112 x 69 cm). Excellent Condition. Okutani Shuseki (1871-1936) was born in Osaka and lived in Kyoto for most of his life. His artistic lineage is among the very best. He, along with Yamamoto Shunkyo and others, studied under Mori Kansai, who was the pupil and adopted son-in-law of Mori Tetsuzan, who was one of Maruyama Okyo's best pupils. Like all painters of the Mori family school, Shuseki's nature paintings are remarkable for their unsentimental naturalism, showing his keen interest in the essence of nature. He won prizes at numerous exhibitions and founded his own art school. 21 x 8.5 inches, 53 x 21.5 cm. cf. Ekkehard May and Daniel McKee's Haiku & Haiga, Amsterdam, Hotei, 2006. Okutani Shuseki (1871-1936) was born in Osaka and lived in Kyoto for most of his life. His artistic lineage is among the very best. He, along with Yamamoto Shunkyo and others, studied under Mori Kansai, who was the pupil and adopted son-in-law of Mori Tetsuzan, who was one of Maruyama Okyo's best pupils. Like all painters of the Mori family school, Shuseki's nature paintings are remarkable for their unsentimental naturalism, showing his keen interest in the essence of nature. He won prizes at numerous exhibitions and founded his own art school. 21.5 x 8.5 inches, 54.5 x 21.5 cm. cf. Ekkehard May and Daniel McKee's Haiku & Haiga, Amsterdam, Hotei, 2006. Okutani Shuseki (1871-1936) was born in Osaka and lived in Kyoto for most of his life. His artistic lineage is among the very best. 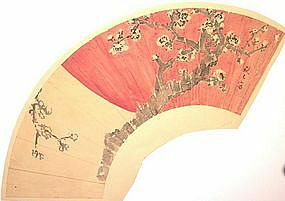 He, along with Yamamoto Shunkyo and others, studied under Mori Kansai, who was the pupil and adopted son-in-law of Mori Tetsuzan, who was one of Maruyama Okyo's best pupils. Like all painters of the Mori family school, Shuseki's nature paintings are remarkable for their unsentimental naturalism, showing his keen interest in the essence of nature. He won prizes at numerous exhibitions and founded his own art school. 22 x 8.5 inches, 56 x 21.5 cm. cf. Ekkehard May and Daniel McKee's Haiku & Haiga, Amsterdam, Hotei, 2006. 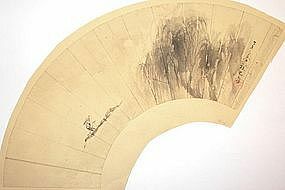 A prominent Japanese dealer is currently offering a Kawabata Gyokusho painting of similar size for $21,500. You can find this painting online. 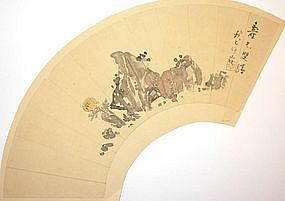 Kawabata Gyokusho is considered the last great representative of the Shijo school of Japanese painting. His work is quite delicate, making use of Japanese technique in a realistic manner. He had many pupils who later became well known. His paintings are in the permanent collections of many major museums, including Oxford's Ashmolean Museum, New York's Metropolitan Museum, Boston's Museum of Fine Arts, Tokyo's National Museum, and London's Victoria and Albert Museum. This beautiful painting of his will make even the non-Japanese share the feeling that the Japanese have long had for Mount Fuji, that Fuji is a god and her surrounding waters and trees pay tribute to her. Silk Canvas. 48 x 20 inches, 122 x 50.5 cm, unmounted. cf. Nagatake Asano, Yukio Kobayashi, and Moritatsu Hosokawa, eds. 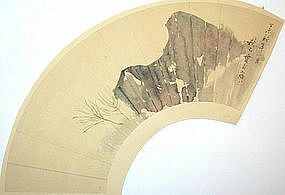 Genshoku Meji Hyakunen Bijutsukan (Color Reproductions of Meiji Centennial Exhibition), Tokyo: Asahi Shinbunsha, 1967; Serge Eliseev's La Peinture Contemporaine au Japon, Paris: E. de Boccard, 1923; Mosho Kawabata, ed. Gyokusho-o Iboku-shu (collection of Gyokusho's Paintings), Tokyo: Kogeisha, 1931; Kurashina Zuroku Kindai Nihonga (Catalog of Japanese-Style Paintings Owned by The Tokyo University of Arts), Tokyo: Tokyo Geijutsu Daigaku, 1954; Arthur Morrison's The Painters of Japan, 2 volumes, London and Edinburgh: T.C. and E.C Jack, 1911; C.H. Mitchell's The Illustrated Books of the Nanga, Maruyama, Shijo, and other Related Schools of Japan: A Bibliography, Los Angeles: Dawson's Book Shop, 1972; Laurence P. Roberts' A Dictionary of Japanese Artists, New York, Weatherhill, 1976; and Naoteru Uyeno, ed. Japanese Arts and Crafts in the Meiji Era (English adaption by Richard Lane), Tokyo: Pan-Pacific Press, 1958. See also the following journals and serial publications: Kokka #7 (illustrated monthly journal of Oriental art), Tokyo: Kokkasha; Museum #202 (monthly publication of the Tokyo National Museum); Nihon no Bijutsu #17 (Japanese Art), Tokyo National Museum, Kyoto National Museum, and Nara National Museum, eds., Tokyo: Shibundo; Nihon Bijutsu Zenshu volume 6 (Collection of Japanese Fine Art), 6 volumes, Tsuneo Fujita, ed., Tokyo: Bijutsu Shuppan-sha, 1969.